My appreciation for mushrooms has only recently developed. In fact, I think this is the first time I’ve ever cooked with them. For the longest time I would avoid them, mainly because their texture just didn’t do it for me. However, I’ve recently learned that if they’re covered in enough butter, garlic, and wine, I’m a very happy camper. Last week I was craving something rich and delicious, and this dish hit just the spot. The original recipe I made (adapted from Pinch of Yum) yielded wayyy more servings than I needed — about eight total. Considering I’m generally over a meal after about three servings, eight was definitely over kill. I ended up making a whole lot of risotto cakes to keep my palette interested (to make — form little patties, dip in egg wash, cover in panko, pan fry, and serve with a side of Greek yogurt). A very tasty interpretation, if I must say! In a large skillet, cook your bacon over medium-low heat. Once crispy, allow the grease to settle on a plate with a paper towel. After it has cooled, chop roughly and set to the side to prepare the rice. On medium-low heat, melt the butter to a nice sizzle. Add your garlic, onion, rice, and a splash of the wine. Allow to toast slightly before adding the rest of your wine and vegetables. Cook your vegetables down slightly before adding 1/4 of your broth. The next few steps are all about watching your rice. Once it has soaked up the liquids, add another 1/4 of your broth. Repeat this step twice more until all of your broth has been added. This is should take about 20 minutes. At this point add in your bacon, a dash of salt and pepper, and mix well. By now your rice is cooked and ready to serve. Top it off with some grated parm and dive in. With sunshine extending past work hours these days, the idea of having friends over and making a spring dish with a matching cocktail is sounding pretty good. Now that our hibernation mode is nearing an end, eating heavy foods just doesn’t sound nearly as appealing as it once did. We’re lightening things up a bit to jump-start spring, and these recipes sound like a wonderful way to do so! 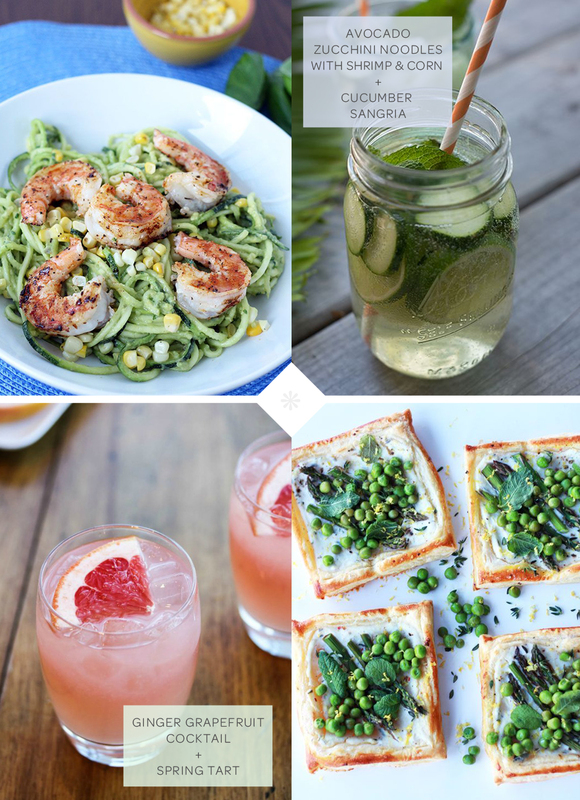 We’ve paired 2 delicious sounding light dinners with equally delightful drinks. Enjoy!